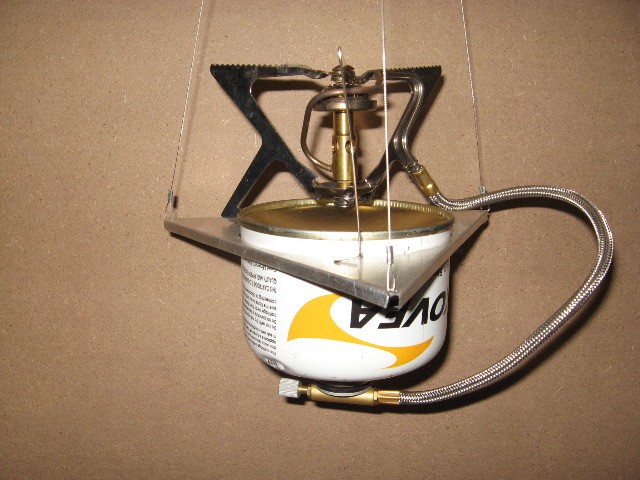 These wind tests were done on my Trangia 27-1 using a Kovea Ti Supalite stove that has been modified by adding a pre-heat tube and stand, this allows the stove to be used in a remote canister configuration with the Trangia windscreen and base, the holes in the base were positioned away from the wind. The pot used was the 1 liter 27-1 Trangia pot. 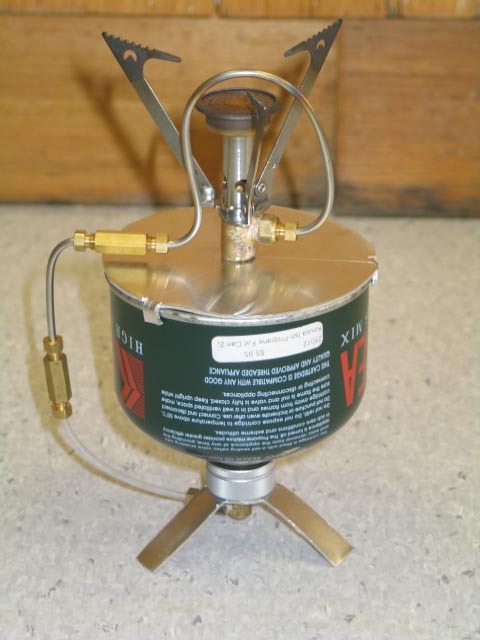 The tests were done with the canister in an upright position, to get consistency I put an adjustable valve on the canister and ran the stove until the flame was at a fairly high stable level I then only used the valve on the canister to turn the stove on and off. 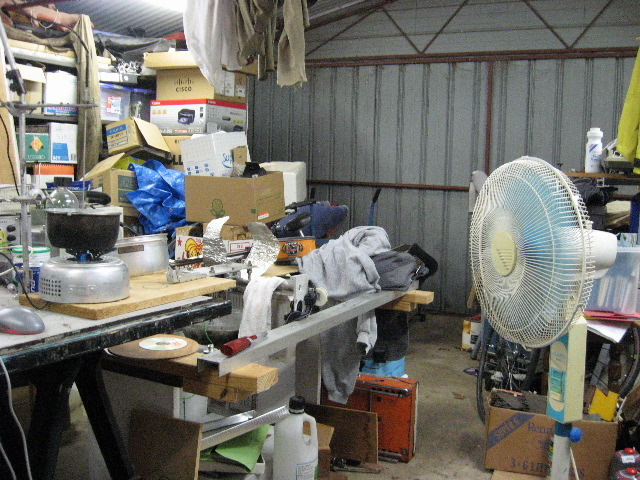 Test 2, wind with windscreen, stove was lit, then fan turned on. Test 3, wind, no windscreen, During this test it was obvious that it this system is greatly effected by wind and to raise the water to 95ºC was going to take some considerable time and fuel, I stopped the tests at the same time as the no wind test and as the heating rate is usually linear I extrapolate the results. Test 4, the holes in base are placed into wind. As can be seen from the fuel used in the wind/no windscreen test the Kovea stove efficiency was affected quite a lot by wind but the use of the Trangia windscreen does improve the efficiency to the point where if used correctly, wind may have a very small affect on efficiency, the difference between the results of the no wind and wind/windscreen tests is very small the difference could be considered in normal testing error. 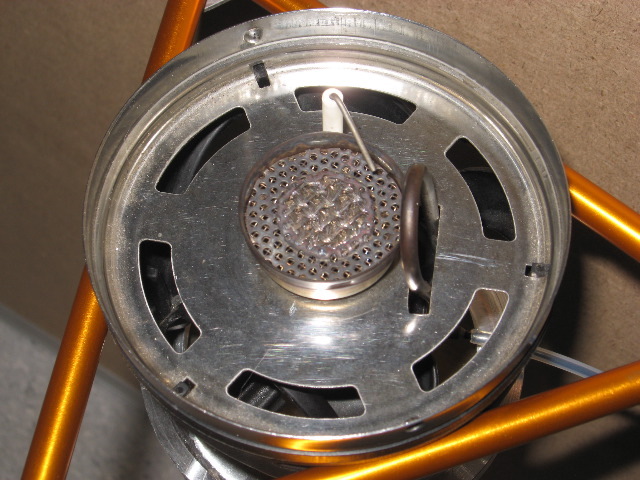 The Trangia stove system with its inbuilt windscreen is very good in windy conditions but it is preferable to place the holes away from the direction of the wind. 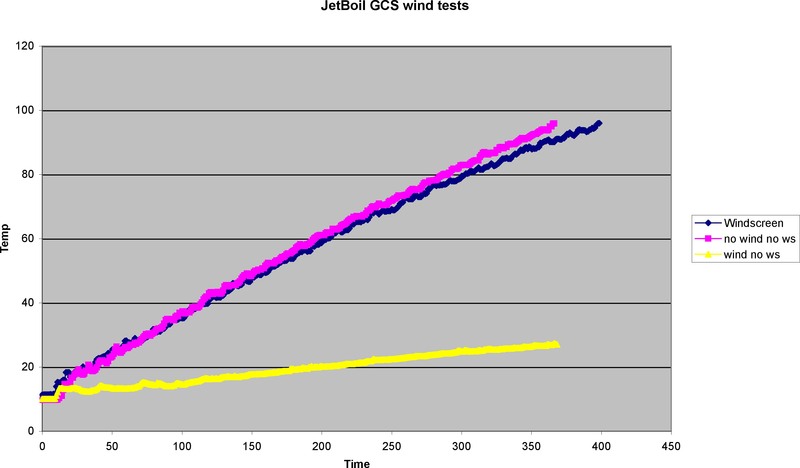 So on the weekend I ran some wind tests on the Jet Boil Group Cooking System (GCS). These test were done slightly different than the PCS tests as I ran the remote canister in upright configuration, I decided to do this to try and get better consistency in the tests, to do this I put a adjustable valve on the canister and ran the JetBoil stove until the flame at a high level and was stable I then only used the valve on the canister to turn the stove on and off. My STD 0.5 liters of water were used. The wind speed measured was around 12-15 kph. 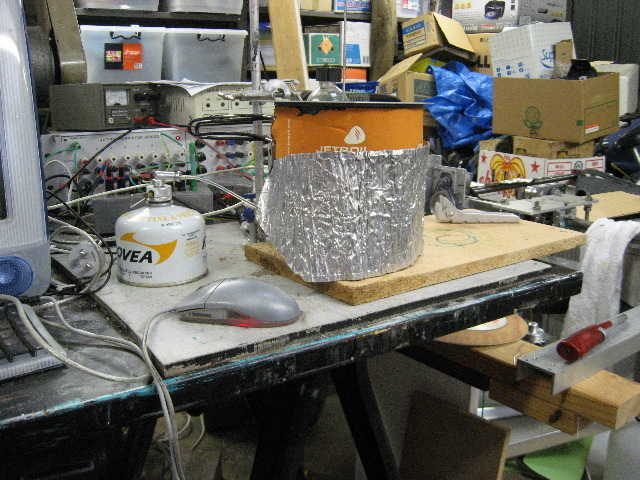 Test 2, wind with windscreen, stove was lit then windscreen placed around stove, then fan turned on. As can be seen from the fuel used in the wind/no windscreen test the GCS stove efficiency is affected quite a lot by wind but the use of a windscreen does improve the efficiency and possibly if the windscreen is setup properly wind may have no effect, the difference between the results of the no wind and wind/windscreen tests is very small this difference could be considered in normal testing error. Unlike the PCS stove the GCS stove system efficiency is greatly affected by wind but the use of a good fitting windscreen can greatly improve efficiency to the point that the wind may have little or no effect. 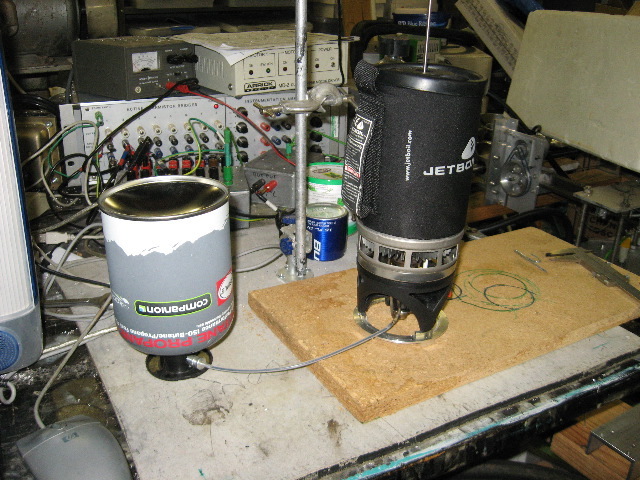 Following on from the hanging stoves I fired up the test bench on the weekend and ran some wind tests on the JetBoil stove that I have modified for the hanging stove. 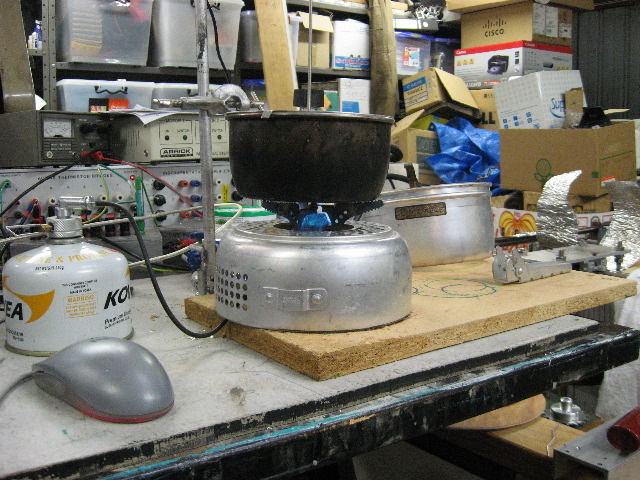 Part of the design of my JB hanging stove is that it does not have to be hung, it can be used as a normal remote canister stove, for these test I used the stove as a remote canister stove. 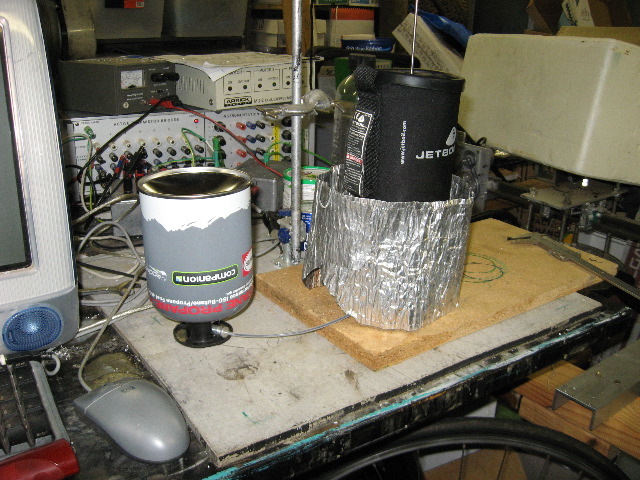 The stove was placed on my test bench with a small pedestal fan placed a meter away, I placed my old Vane Anemometer on the bench and tested wind speed which was measured at around 12kph (note, the wind speed feels faster that 12kph but I could be wrong) I then attached the stove to the canister and took note of weight, measured 500g of water in pot, replaced lid. 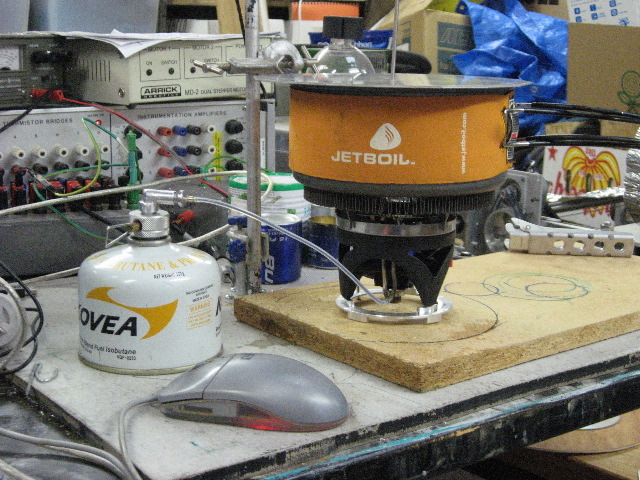 The first test was with no windshield and no wind, this is used a base line figure. 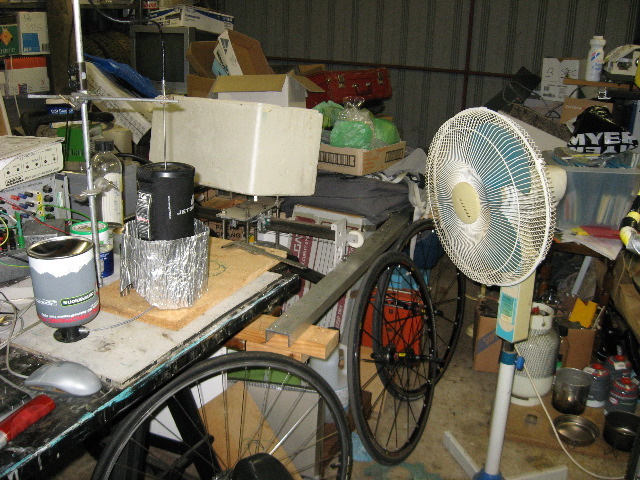 The second test was with the fan on but no windshields. The third test was with fan on and using an old MSR wind screen which was placed completely around and secured together with a clip. The fourth test was using a Trail designs Caldera Cone windscreen, this windscreen is designed for a BPL Ti 550 pot and was too small to fit over the JB pot with the cozy on it, so I placed the windscreen as best as I could around the pot with the gap opposite the fan, the fuel line came out this gap. 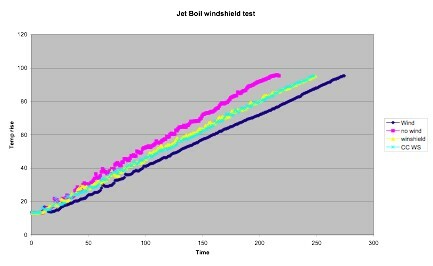 Below is the heating rate graph, the fastest boil (pink line) is the test with no wind the slowest is the test with wind but no windshield. First I wish to point out that these tests are not what I would call scientific, I only did one run per test and with canister gas stoves they are very hard to adjust to repeat runs, but there is a trend that fits in with what I was expecting. The result clearly show that there is a reduction of efficiency with the introduction of wind, and that a windshield does make a difference, I am surprised how little loss of efficiency the JB system has with no windshield., from past tests with a normal upright stove with no windscreen there was a much high loss, I am also surprised with this system what little difference a windshield made to the efficiency and these test the CC windshield was only marginally better that the MSR windshield. I am not a climber and probably will never be, I enjoy fiddling with stove design. 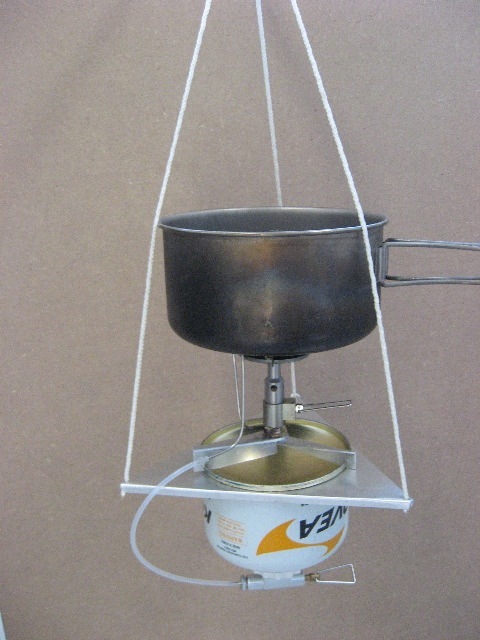 I got interested in hanging stoves a few weeks ago after reading a comment about hanging stoves on an Australian Bushwalking forum, the comment reminded me of liquid feed stove system I started working on about five years ago, as can be seen from the photo I put a Pocket Rocket stove on the base of an upside down canister, part of the idea in doing this is in very cold conditions there is an option to put some of the reflected heat back into the canister, for some reason I shelved this idea until now. 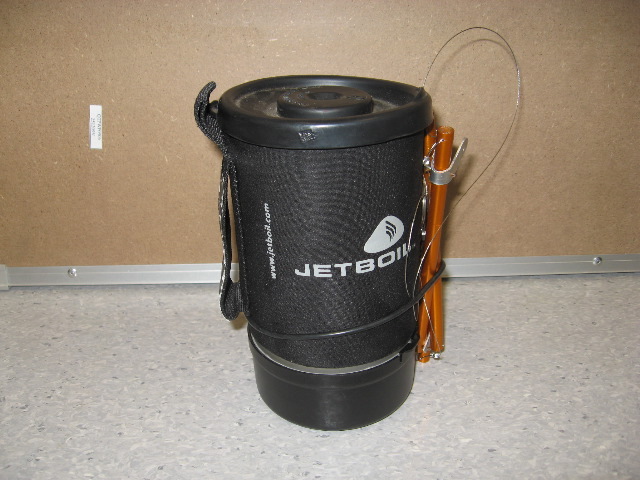 While I do not climb I can see some advantages of hanging stoves in some cases in backcountry snow camping. 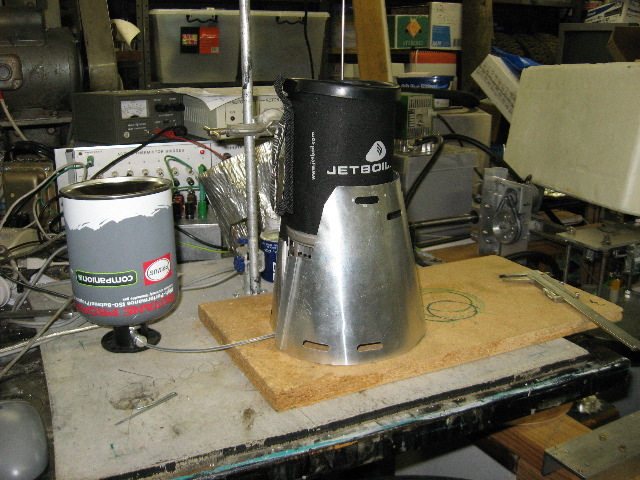 I started my recent hanging stove project by making a simple hanging stove bracket to hold the canister upside down, I then made some legs and a pre-heat tube modification for a Gnat Ti stove (called Kathmandu Backpacker Stove Titanium here in OZ), the legs have been made to clip on the base of the canister. 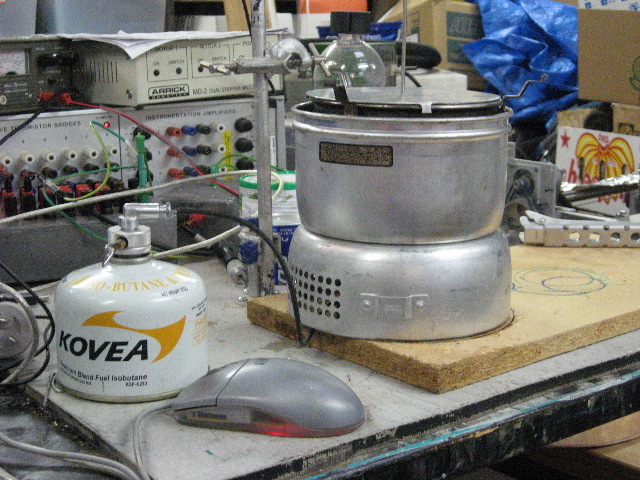 This worked well except the Gnat stove has something wrong with it and I have difficulties with simmering in both the upright canister configuration and liquid feed configuration., I have since replaced the Gnat with my favorite a Kovea Supalte Ti stove and all is working well. My cheap remote canister stove then turned up and with the current hanging plate the new stove fitted very nicely on the base of the canister, but I will point out that at the moment this is just playing with design and I realize that with this system would be difficult to fit a wind shield and pack away. 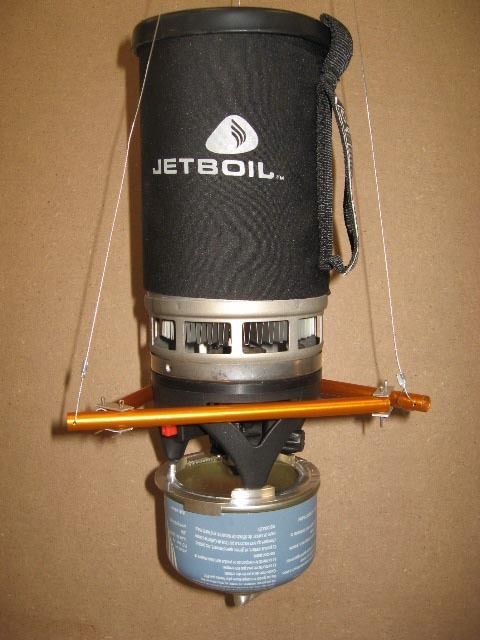 The next part of my hanging stove project was to use a JetBoil Personal Cooking System (PCS) with a liquid feed modification that I had done a number of years ago will before JetBoil came out with the Helios I have used my modified JB stove in winter in Australia a few times so I know that it works in cold conditions. I needed to hang the canister on the base, so I machined up a bracket that screwed onto the plastic shroud, the bracket takes the std JB 100g canister, I did the machining so the canister clips in so it does not fall out while it is still easy to put in, and that it would still fit into the JB PCS pot. I then needed some way to hang the JB stove, I did not want to buy a JB hanging kit as they are expensive here in OZ, so I got a some spare tent poles and some SS wire form the local fishing store and made a rough copy, while the hanging kit is OK for display purposes I would not like to assemble it on the side of a cliff at -20ºC, some more design thoughts needed here. I am combining this project with one that I have been thinking about doing for a while and that is windscreen design. 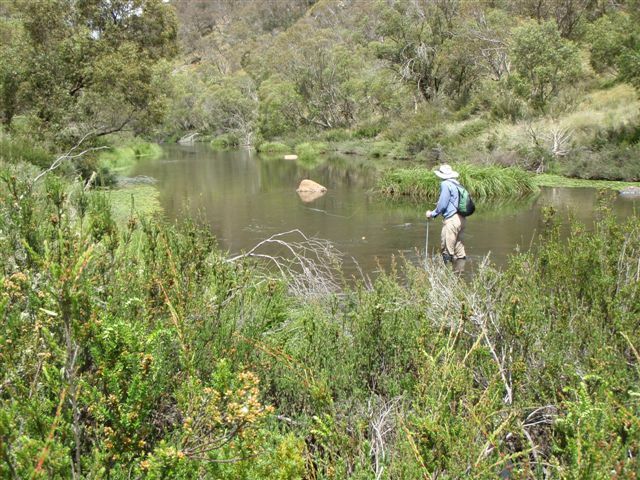 One Friday evening a few weekends ago, my mate Dave and I backpacked into nice river somewhere in the Australian High country to do some fly fishing, Dave brought along his No 4 and his Tenkara Yamame rod, I had decided to go lightweight and only brought along my Yamame rod. We had planned to fish Friday evenings rise but it was raining heavily so we settled down around the fireplace in an old cattleman’s hut and had a nice evening eating our gourmet takeaway curry and drinking some Port. On Saturday morning we started fishing at about 7.30am, Dave decided to use his No 4 rod and as mentioned previously I only had my Yamame rod. The conditions where just about perfect, it had been raining the day and night before and the river had a good flow in it and we had a slight breeze to our backs, we both tied on much the same combination a small brown dry with a beaded nymph trailing about 30 cm below. After a few casts I hooked up a nice half kilo (1 pound) rainbow, Dave also did not take long for his first. 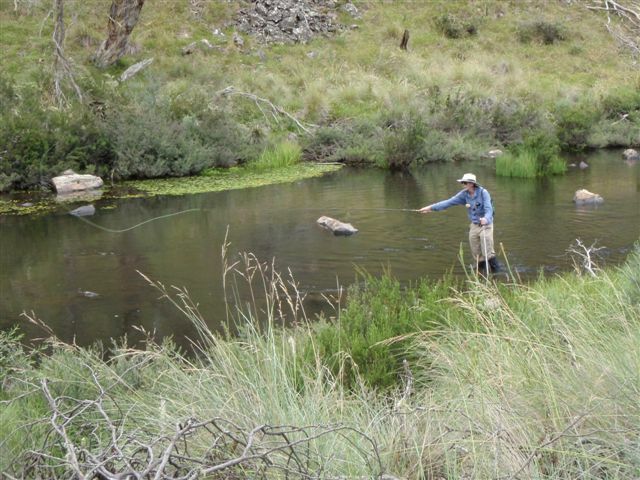 Dave is a fly fisherman who likes to do a bit of bushwalking but I am a Bushwalker who likes to do a bit of fly fishing, in the 6-7 years I have fishing with Dave all but once he has out fished me but for some reason that morning I was doing better on my Yamame, I was catching three fish to Dave’s two. Early on in the morning I was catching the fish up on the nymph but as the morning was passing I started to get more on the March Brown or Royal Wulff dry fly, some where small but most where around half a kilo, a few a bit bigger, all where released. As the temperature heated up things started to slow down, we decided to go back to camp, have some lunch a rest (sleep) and fish the evening rise, I had a tally of around 15 rainbows and browns, Dave with his No 4 had only about 10, I had out fished him with my simple lightweight Tenkara rod, a rare feat. That evening Dave taking my lead, decided to use his Yamame, we wondered down to different part of the river, Dave started at the middle of a big pool and I started up stream at its head, I tied on a Royal Wulff and on my first cast I caught a nice 600-700g rainbow, at that spot I landed three very nice rainbows, after my second I had decided to move on and had collapsed my rod, the line was still in the water, when I started to pull the line in a nice little rainbow could not resist, I had my third from the same spot and dinner, who needs a rod. I continued slowly upstream, after a short time my evening tally was 5, all over half a kilo, I kept one for dinner, expecting Dave to have kept one too, after about 40 minutes Dave caught up to me, he had hooked what he thought was a 1.5 kilo (three pound) rainbow, fought it for a few minutes before it broke him off in the rushes, he decided to move on but when he went to collapse his Yamame, the second and third sections where stuck hard, Dave unfortunately broke the second section trying to release the stuck pieces, he was pssed off, and was especially po’fd when I told him I had five but only kept one, Dave had no dinner, so I loaned Dave my rod, he fished for about ten minutes before he decided that it was not his night, I took over and hooked a very nice rainbow right in front of him, me 21, Dave 10. After a very nice meal of trout and pasta sitting around the hut fireplace , we finished off the Port and retired ready for a mornings fish, this was to be a different day, we where on the river at around 7.30 again, this time the breeze was coming from up stream, I was finding the fishing hard going, Dave was nailing it, his more powerful no 4 was allowing him to cast much further than I was with my Yamame. We fished until 10.30 am, Dave had 12-13 more and after some very hard work I had only three, in the end we both had caught around 24-25 fish each. It was a real good test putting the No 4 and the Yamame against each other, why did I out fished Dave on Saturday, I have no idea, the fishing gods where with me, but on the Sunday, I had some problems casting into the slight breeze, my fly was not landing well at all, the three fish I did manage to hook where when the wind had died down. All I can say that in the end neither rod or person was the better, but most important of all, we had a very enjoyable weekend, and the river had been a pleasant surprise. Dave has just e-mailed me and the new and spare tips have arrived, outstanding service from Tenkara USA. The Australian alpine country has many old huts spread throughout, these huts were built by cattle and sheep graziers, miners and the Snowy Mountain Authority (hydro power scheme), most of the alpine country is now National Parks, cattle and sheep no longer graze, the miners are long gone. Over the years many huts have gone the victims of neglect, bushfires and National Parks policy. 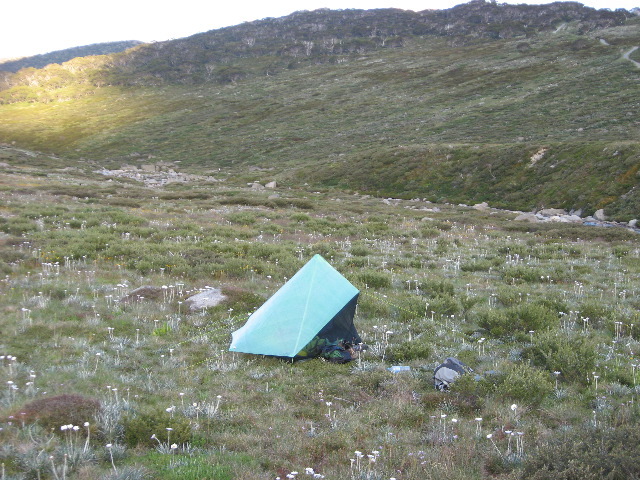 The huts that survive are under the care of the Kosciuszko Hut Association, bushwalking and Ski clubs. 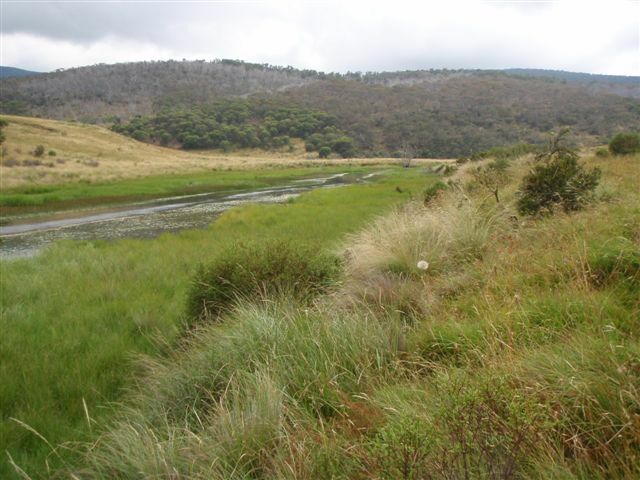 I do most of my bushwalking and skiing in the Alpine country and regularly visit many of the surviving huts. A couple of weekends ago my mate Dave and I where camped near an old cattleman’s hut somewhere in Kosciuszko National Park (New South Wales), it was raining, we had just eaten dinner and where enjoying a mug of Port while sitting around the fire place, when Dave noticed and pointed out a mouse running across the floor, I saw the mouse go down a gap in the floor boards. Out of interest I grabbed my torch and had a look down the hole, the mouse was gone but I saw a dusty, rusty old tin, I grabbed a stick and lifted the tin so I could grab it with my hand. 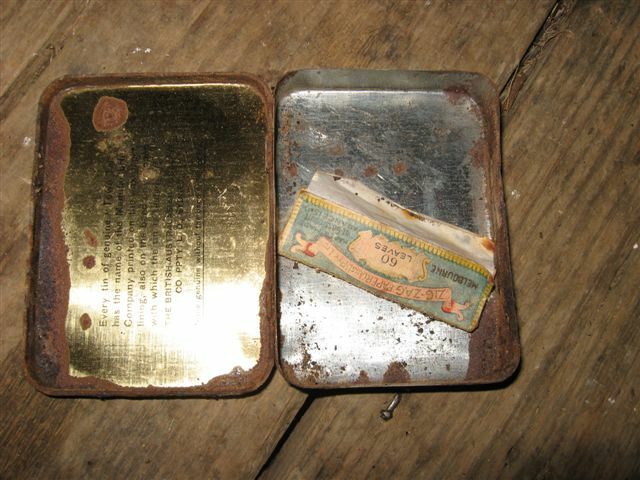 When I got the tin out, I could see that it was an old tobacco tin. On opening the tin I found an old news paper cutting and an opened packet of cigarette papers, both in very good condition. The cigarette papers where an Australian Zig-Zag brand but made in France but the news paper cutting got my interest, the cutting had been torn out of a news paper, on one side there was an advertisement for baldness and dandruff cure, the other side had some general information about a the paper sponsored Sun (news paper) toy fund, an announcement about a new restaurant that had just opened, and an announcement about up coming Australian Naval and Military Expeditionary Force Association Smoke concert. I took photos of the tin and contents and placed the contents back into the tin and the tin back into the hole where I got it from, hoping that it is another very long time before it is found again and that the next finder puts it back for the then next person to find. 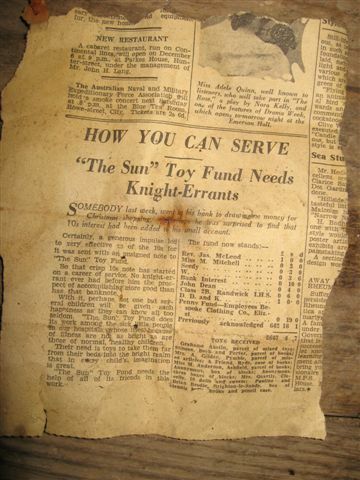 When I arrived home I wanted to see if I could find how old the tin and contents were and if I could when the tin found its way in the hole, the news paper cutting was a clue, there is mention of the “Sun toy fund”, I tried to do some research on the net. 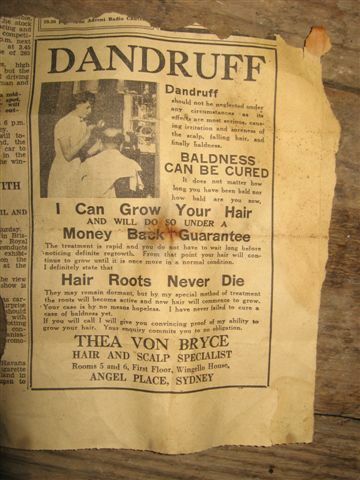 The National Library of Australia has a large collection old news papers some have been scanned and are available on the web. My search for the Sun News paper came up with many choices, I did find a reference to a paper called the Sun that was published from 1910 to 1988 but no Sun newspapers papers where on line. Another clue was that in the Toy fund article a Rev. Jas. McLeod was named as making a donation of one Pound, I did a search on a Rev. Mcleod and there was a Reverend James McLeod that was working in Sydney in the early thirties, another clue could be the article on the Australian Naval and Military Expeditionary Force Association Smoke concert. The Australian Naval and Military Expeditionary Force (AN&MEF) was a small volunteer force of approximately 2,000 men, raised in Australia shortly after the outbreak of the First World War to seize and destroy German wireless stations in German New Guinea in the south-west Pacific. 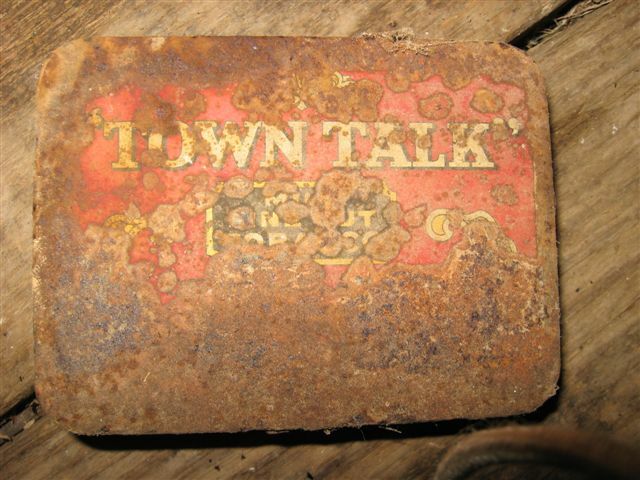 The final clue and a good one is the Town talk brand tobacco tin, a search of 1930’s tobacco tins came up with this site, http://www.carters.com.au/index.cfm/item/17147-various-framed-australian-tobacco-tins/, note the middle tin at the top. My current thinking is that this tobacco tin may have been under the hut floor undiscovered for around 80 years, since the early to mid 1930’s. 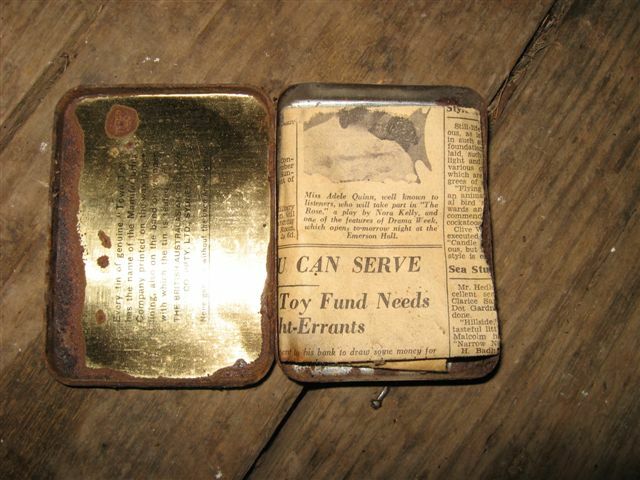 Back in the 1930’s using old tobacco tins to store small items was very common, I would conclude that the owner had the tin next to his bed, when he was near his bed he knocked the tin into the hole, probably without knowing, with nothing of value in the tin he soon forgot about it. EDIT: Apologies, since originally posting this article some of the links had disappeared, but some of the links are traceable but some like the Town Talk tobacco tin seems to have gone forever, several of the links are on Wikipedea but they seem to change the link from time to time so I will leave it up to the their own search. After owning my new Zpacks Hexamid for nearly 10 months I finally got to go on a walk where I could to use it. 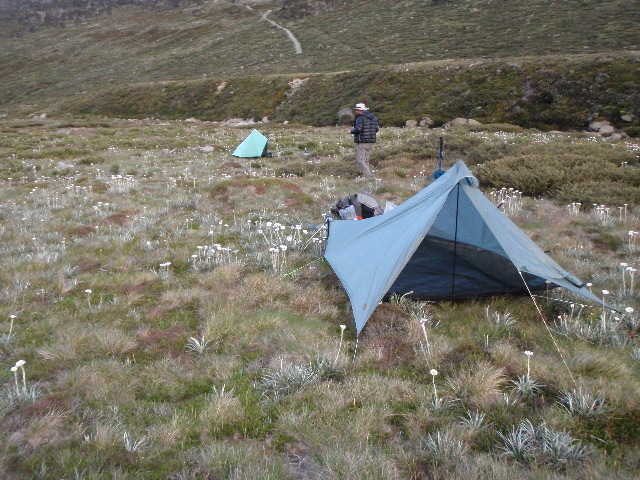 The trip was a three day, two night trip in the Kosciuszko National Park around Australia’s highest peak Mt Kosciuszko, the first night was spent on a ridge near Rams Head at an elevation of 2150m. The ridge was one of the most beautiful places that I have ever set up camp with exquisite views but being high and exposed it was quite windy. I found the hexamid easy to setup and was just roomy enough for my Neoair sleeping mat, pack and some of my gear bags that I wanted easy access to. 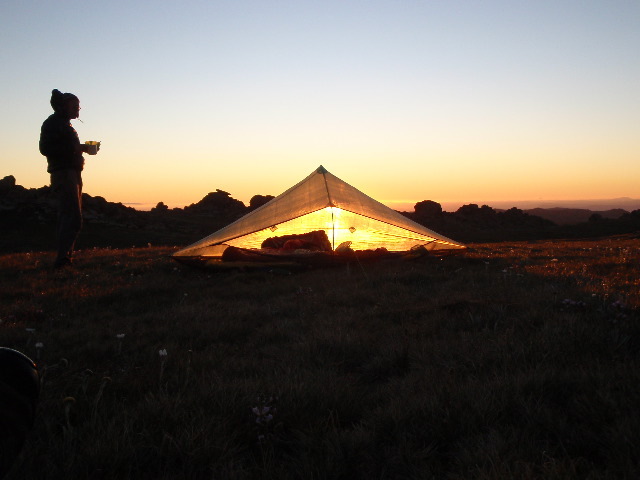 This night I used a Gossamer Gear ploycro ground sheet on top of the mesh netting floor. When changing head room was just adequate, I am 1.82cm tall. As the possibility of rain was forecast I brought the optional door along which I did not use. For a tent pole I used the pole from my Tarptent Contrail which is nearly the perfect length, to protect the tent fly from the narrow end of the tent pole I used a rubber tip from a walking pole, this worked very well. I set the tent up with the backside to the then easterly wind. After retiring for the night I was woken up with the tent flapping in the strong winds, I readjusted the guy ropes and this stopped the flapping a lot, though I still had some noise but this did not stop me from going back to sleep, in the morning I was woken by another flapping noise and discovered it was the polycro ground sheet near the front side, the wind had shifted during the night and was now coming from the west, when the ground sheet was re adjusted the tent was reasonably quiet for the brisk winds that we where having. In the morning there was some condensation inside the hexamid, with the brisk winds I was a bit surprised, but when I thought about it rain was forecast and there was probably a bit of moisture in the air, after a quick shake, the tent packed away easily, the CF stuff sack has ample room for the tent and door, I used a tent pole from my Contrail tent which I packed away in my Tenkara Hane fishing rod sleeve. That day we walked 33k up and over 11 of Australia’s highest peaks, at the end of the day we where absolutely exhausted, we ended up camping beside the Snowy River near Charlottes Pass, the mosquitoes where very bad so after a nice meal we retired early, I had no problems sleeping and was not aware of the Hexamid flapping at all during the night, this time I set the ground sheet up under the fly screen floor. It was a warm night and we where camped near a river, in the morning there was a lot of condensation inside the tent, in those conditions any tent would have had a lot of condensation inside. 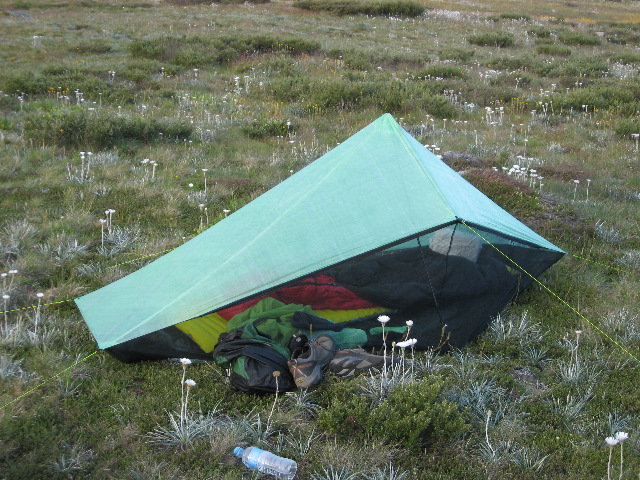 Do I like the Zpacks Hexamid tent after first use, Yes and I look forward to using it on my next trip. 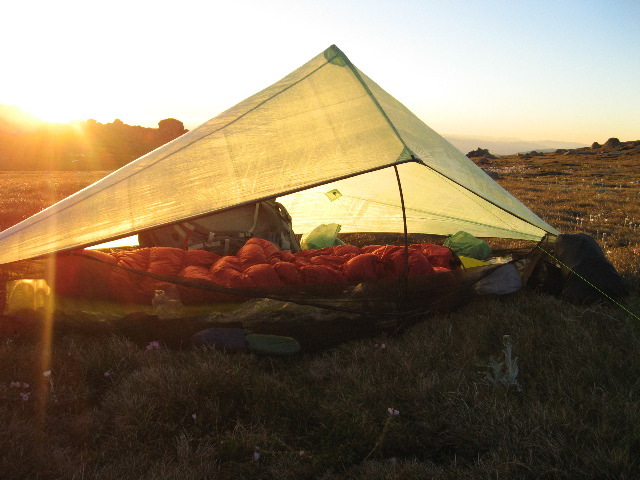 Closeup at dawn, Neo air sleeping mat, WM Summerlite sleeping bag.